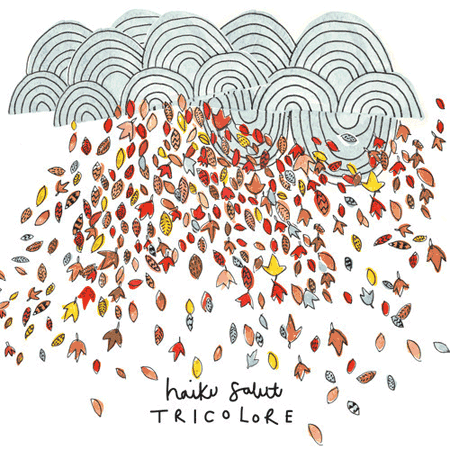 Unless you closely follow the little known — but still robust — musical sub-genre of folktronica, Haiku Salut’s Tricolore will likely be unlike anything you’ve heard before. In their full-length debut, Haiku Salut — made up of musicians Gemma Barkerwood, Sophie Barkerwood, and Louise Croft — explores the genre and their place in it, and in doing so, presents us with both an exciting and playful plethora of sounds and a feeling of potential. The band’s major influences, including Yann Tiersen, Amestub, and early Múm, are prevalent throughout Tricolore, as the purely instrumental album engages various sounds and multicultural elements. Each track features layers upon layers of instrumental dynamism: light and playful piano parts, rhythmic and precise guitar and ukulele fingerpicking, dense accordion arrangements, and the occasional energetic percussion. These various parts ebb and flow across the album, sometimes peaking, sometimes falling, and always working together to give the songs momentum and intrigue. It is obvious the three musicians have amply soaked up various Western and Eastern European musical influences, which are particularly pleasing to an unaccustomed American ear. Moreover, Tricolore‘s incorporation of electronic effects, including electronic instruments, looping, and modulation, distinguishes Haiku Salut’s music from classically-composed soundtracks or instrumental folk albums. Its satisfying machine-like sounds, for example, whir, click, tap, and crunch, so that you can almost feel them through your headphones. These fine details, along with the accordion’s high notes in “Sounds Like There’s a Pacman Crunching Away At Your Heart”, the build-ups in “Six Impossible Things,” and the wall of sound most notably created in the beginning and end of the album, allow Tricolore‘s content to stand out. The challenges a band faces in composing an instrumental album — and a genre-bending one at that — are great. Successfully conveying emotion, consistently keeping the audience engaged, and effectively differentiating your sound and each individual track are all pressing concerns, to which Tricolore is not wholly immune. At some moments, such as in “Rustic Sense of Migration,” the various instrumental layers feel somewhat chaotic; moving without a center, they suffer in their ability to convey real emotion or cohesive narrative. The fact that the album’s “plot” or focus is purposefully opaque, moreover, makes it difficult to grasp moments like these and to glean meaning from the album’s track changes and general arc. Coupling this obscurity with the album’s partial lack of a certain atmospheric quality, which perhaps only comes with age, moderately holds the album back from reaching its full potential. That being said, potential is certainly present, sweating and beating at the heart of Tricolore. Because of the trio’s musical abilities as well as their adeptness with instrumentation and composition, Tricolore manages to grab you and let you go without demanding your full attention, so that its melodies grow on you the more you listen. Additionally, the album has several high points that are truly emotive, such as the chord constructions on “Glockelbar”, and that more satisfyingly embrace and successfully incorporate the band’s electronica side, like the explosion of big sound on “No, You Say It”. These impressions indicate that we will have much to look forward to in Haiku Salut’s future, and much to enjoy as we let their first full-length soak in.